This study aimed to evaluate the diagnostic value of MRI in the assessment of painful hip joints in adults. Hip pain has different etiologies. MRI is the method of choice for characterizing various disorders and for assessing the full extent of osseous, chondral, and soft-tissue abnormalities of the hip joint. This retrospective study was conducted on 35 patients with painful hip joints. The following MR sequences were performed on all patients: Coronal T1, T2, and STIR-weighted images (WIs,) axial T1 and T2 WIs, axial T1 WI, and sagittal T1 WI after contrast injection in five patients. Patient history, local examination of the diseased hip, and laboratory investigations were performed. The male-to-female ratio was 20: 15, and their ages ranged from 15 to 75 years with a mean value of 45 years. The final MRI diagnoses in 35 patients were as follows: avascular necrosis in 10 (28.57%), transient synovitis in eight (22.86%), septic arthritis in four (11.43%), malignant neoplasm in four (11.43%), osteoarthritis in two (5.71%), bone marrow contusion in three (8.57%), migratory osteoporosis in one (2.86%), bursitis in one (2.86%), and stress fractures in two (5.71%) patients. MRI of the hip joint is a safe, reliable, diagnostic, and accurate imaging modality for the assessment of hip pain and is sufficient for delineation of different hip joint pathologies. The hip is a ball and socket, weight-bearing synovial joint. This configuration permits a wide range of motion; however, its stability is maintained by several structures that encase the joint . Hip pain is a common problem, and it can be confusing because there are many causes. The common causes include arthritis (which is among the most frequent cause of hip pain), trochanteric bursitis (which is an extremely common problem that causes inflammation of the bursa over the outside of the hip joint), tendonitis (which can occur in any of the tendons that surround the hip joint and the most frequently encountered tendonitis around the hip is iliotibial band tendonitis), and osteonecrosis (which occurs when the blood flow to an area of bone is restricted leading to death of the bone cells, bone collapse, and snapping hip syndrome) . MRI is an excellent noninvasive modality for characterizing various disorders and assessing the full extent of osseous, chondral, and soft-tissue involvement. MRI can also demonstrate joint effusion, synovial proliferations, articular cartilage abnormalities, subchondral bone, ligaments, muscles, and juxta-articular soft tissue . This study was approved by ethical committee at faculty of medicine menofia university. This retrospective study was conducted on 35 patients with painful hip joints, presenting with various symptoms; the study included 20 males and 15 females with ages ranging between 15 and 75 years. After obtaining their consents, all patients underwent complete history taking, local examination of the diseased hip, and laboratory investigations. All patients underwent MRI examination of the hip joint. Postcontrast, T1-weighted images (WIs) were obtained immediately after intravenous bolus injection of gadolinium-DTPA at a dose of 0.1 mmol/kg in five patients who were clinically and radiologically suspected to have neoplastic tumor, in four patients with septic arthritis, and in one patient with gluteal abscess. MRI examinations of both hips were performed for all patients using a Toshiba Excelart Vantage 1.5-T MRI Machine Scanner (Toshiba, USA). The findings obtained by MRI were recorded and compared with the final diagnoses obtained by surgical data, aspirated fluid analysis, histopathology, and follow-up by clinical, laboratory, and other imaging studies. Patients were typically positioned supine on the examination table. Their feet were internally rotated and gently immobilized with a tape if necessary with slight flexion at the knees. Both hips were examined for suspected bilateral abnormalities using the body coil with a large field of view to determine the extent of the lesions and to allow for comparison between the normal and the abnormal sides. The slice thickness was adjusted to 4–8 mm, and thinner slices were used when more details were required. Images were taken in the following sequences. Scout view of the hip: coronal TI-weighted imaging (WI) was performed for all cases for localization of subsequent slices of different planes and to delineate the anatomy. Coronal T1 WI and T2 WI, axial T1 WI and T2 Ws, sagittal TI WIs, coronal STIR WIs, and postcontrast TI WIs in the sagittal, axial, and coronal planes were obtained immediately after intravenous bolus injection of gadolinium-DTPA at a dose of 0.1 mmol/kg in the inflammatory and neoplastic cases. The examinations were revised to detect and assess any abnormalities using an AZE, Otemaci-Nomura Bldg 10F 2-1-1 Otemachi Chiyoda-ku Tokyo, Japan workstation. The data collected were tabulated and analyzed by statistical package for the social science software (SPSS, version 11, SPSS Inc., Chicago, USA) on an IBM-compatible computer. Qualitative data are expressed as numbers and percentages. A total of 35 patients with pain in the hips were included in the present study. The male-to-female was 20:15, and their ages ranged from 15 to 75 years with a mean age of 45 years. The most frequently involved age group was 15–25 (24%) years. As all patients presented with painful hips, additional clinical presentations were also determined. The most frequent clinical presentation following hip pain was decrease in the range of movement and abnormal gait (n = 17, 48.57%), followed by radiating pain to the buttocks and/or front of the thighs (n = 10, 28.57%), hip pain with constitutional manifestation (n = 9, 25.71%), and finally hip pain with lower back pain (n = 5, 14.29%). MRI findings showed high prevalence of joint effusion in 43 (89.58%) hips, followed by bone marrow edema in 23 (47.9%) hips, femoral head irregularity and/or collapse in 16 (33.3%) hips, subchondral fissure in 11 (22.9%) hips, and subchondral cysts in six (12.5%) hips [Table 1] and [Figure 1]. Figure 1: Distribution of the studied patients according to MRI findings. On the basis of the findings obtained by MRI, the final diagnoses of the 35 patients with abnormal scans were avascular necrosis in 10 (28.57%) patients, transient synovitis in eight (22.86%) patients, septic arthritis in four (11.43%) patients, malignant neoplasm in four (11.43%) patients, osteoarthritis in two (5.71%) patients, bone marrow contusion in three (8.57%) patients, migratory osteoporosis in one (2.86%) patient, bursitis in one (2.86%) patient, and stress fractures in two (5.71%) patients [Figure 2]. 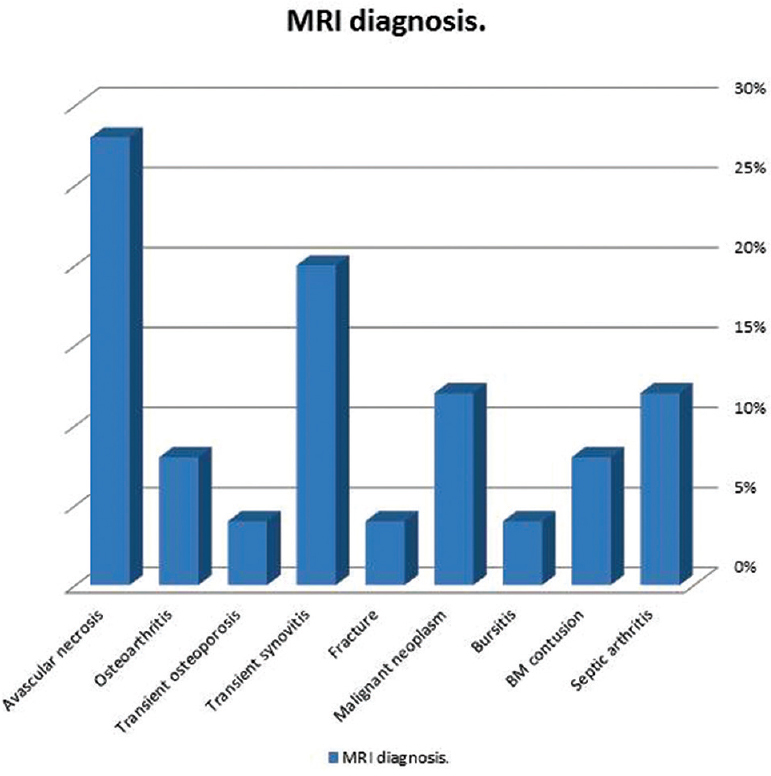 Figure 2: Distribution of patients according to MRI diagnoses. The sensitivity of the MRI in the diagnosis of different hip joint lesions according to the true-positive and false-negative cases is described in [Table 2]. 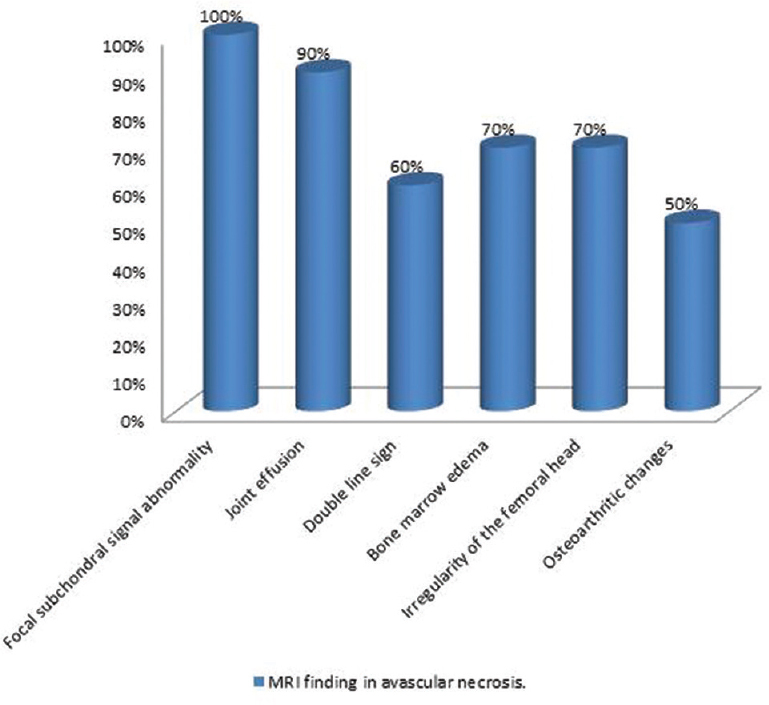 The dominant MRI finding in avascular necrosis was focal subchondral signal abnormality which was identified in all patients with affected 14 hips [Table 3] and [Figure 3]. Figure 3: Distribution of patients with avascular necrosis according to the diagnostic MRI findings. The diagnostic MRI findings of the five cases with transient synovitis are described in [Table 4] [Figure 4], [Figure 5], [Figure 6]. Figure 4: Case 1: Male patient, aged 46 years, presented with bilateral hip pain for 4 months. His left femoral head showed epiphyseal subcortical fissuring with ‘double-line sign’ associated with minimal joint effusion and right femoral head multiple serpiginous abnormal signal intensity, surrounded by a low signal intensity rim in all pulse sequences with minimal joint effusion (bilateral avascular necrosis of femoral head, left grade III and right grade II). (a) Antroposterior radiography. (b) Axial T1. (c) Axial T2. (d) Coronal T1. (e) Coronal T2. (f) Coronal STIR. Figure 5: Case 2: Female patient, aged 40 years, presented with right hip pain for 3 months, radiating to the buttocks, abnormal gait, limitation of movement, and constitutional manifestation. Irregularity of the right femoral epiphysis with low signal in T1-weighted image (WI) and bright signal in T2 WI and STIR with loss of joint space associated with synovial thickening, moderate joint effusion, and multiloculated cystic lesion showing marked enhancement after contrast injection (septic arthritis associated with gluteal abscess). (a) Coronal T2. (b) Coronal STIR. (c) Axial T2. (d) Axial T1 postcontrast. (e) Coronal T1 postcontrast. (f) Sagittal T1 postcontrast. Figure 6: Case 3: Male patient, aged 65 years, presented with left hip pain for 2 months radiating to the front of the thigh that increased with movement homogeneously. Hypointense signal in T1-weighted image (WI) and hyperintense signal in T2 WI and STIR associated with left minimal joint effusion were observed (transient migratory osteoporosis). (a) Axial T1. (b) Axial T2. (c) Coronal T1. (d) Coronal T2. (e) Coronal STIR. (f) Axial T1 fat sat. Hip pain is a common and disabling condition that affects patients of all ages. The differential diagnosis of hip pain is broad, presenting a diagnostic challenge. MRI should be performed if the history and plain radiograph results are not diagnostic . Our study included 35 patients with painful hips; 20 (57.14%) were males and 15 (42.86%) were females, and their ages ranged from 15 to 75 years with the mean of 45 years. On the basis of the findings obtained by MRI, the final diagnoses of the 35 patients with abnormal scans were avascular necrosis in 10 (28.57%) patients, transient synovitis in eight (22.86%) patients, septic arthritis in four (11.43%) patients, malignant neoplasm in four (11.43%) patients, osteoarthritis in two (5.71%) patients, bone marrow contusion in three (8.57%) patients, migratory osteoporosis in one (2.86%) patient, bursitis in one (2.86%) patient, and stress fractures in two (5.71%) patients. Ragab et al. reported that among 34 patients who complained of hip pain in their study of MRI features in different hip disorders, 21 (61.8%) were men and 13 (38.2%) were women. Unilateral hip involvement was identified in 31 (91.2%) patients, and bilateral hip involvement was found in three (8.8%) patients. The final diagnoses included avascular necrosis in 10 (29.4%), septic arthritis in two (5.9%), tuberculous arthritis in four (11.8%), reactive arthritis in one (2.9%), osteomyelitis in two (5.9%), osteoid osteoma in one (2.9%), sickle cell anemia in two (5.9%), lymphocytic leukemia in one (2.9%), osteoarthritis in two (5.9%), transient osteoporosis of the hip in seven (20.6%), and femoral stress fractures in three (8.8%) patients . In our study, osteonecrosis of the femoral head was graded into four stages according to MRI signal intensities changes in T1 WI and T2 WI as follows: one (7.14%) hip, stage 1; two (14.29%) hips, stage 2; six (42.86%) hips, stage 3; and five (35.71%) hips, stage 4. Most of the patients in this study (80%) were diagnosed in the advanced stages of the disease – that is, stages III and IV. Kamal et al. reported that the distribution of patients diagnosed with avascular necrosis of the femoral head according to disease stage was as follows – 4.35% of patients were diagnosed in stage I, 9.78% of patients were diagnosed in stage II, 34.78% of patients were diagnosed in stage III, and 51.09% of patients were diagnosed in stage IV of the disease. This means that more than half of the patients (51.09%) were diagnosed in the last stage of the disease, stage IV, and most patients in the study (85 87%) were diagnosed in advanced evolutionary stages of the disease – that is, stages III and IV . In our study, the dominant MRI finding in avascular necrosis was focal subchondral signal abnormality, which was identified in all 10 patients with 14 (100%) affected hips, followed by joint effusion in 12 (85.71%) hips, bone marrow edema in 10 (71.43%) hips, irregularity of the femoral head in nine (64.29%) hips, double-line sign in eight (57.14%) hips, and osteoarthritic changes in seven (50%) hips. The MRI findings were true positive in nine patients and false negative in one patient; the sensitivity of MRI in the diagnosis of avascular necrosis was 90%. Takatori et al. 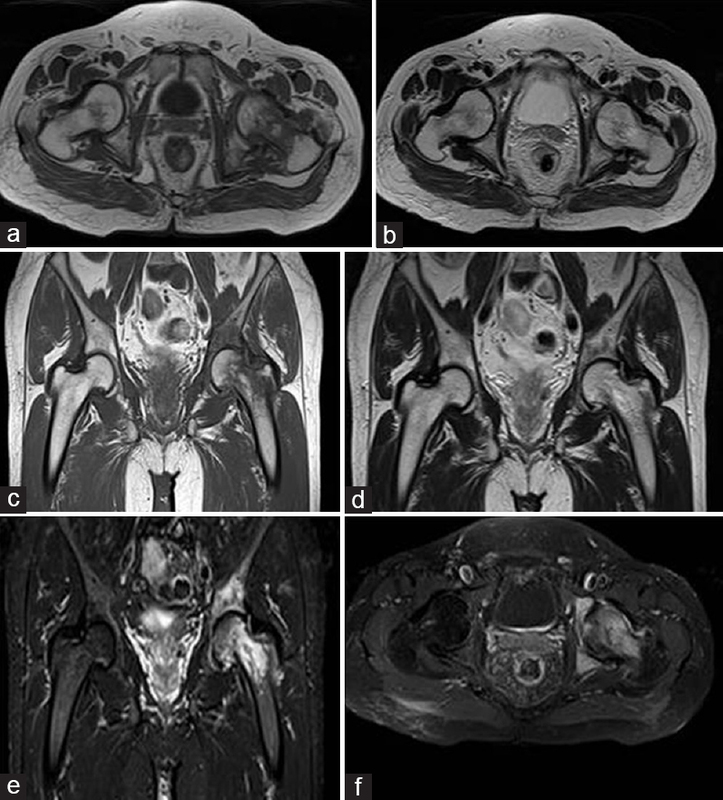 reported that 85% of patients with avascular necrosis show a characteristic 'double-line' sign on T2 WIs. MRI is reported to have a sensitivity of 95% and a specificity of 98% in the diagnosis of avascular necrosis (AVN) of the hip. It detects bone marrow edema associated with early avascular necrosis, which is seen as decreased signal intensity with poorly defined margins on T1 WIs . In our study, eight patients were diagnosed with transient synovitis. The MRI findings identified in all eight patients were joint effusion (100%), followed by synovial thickening (68.75%) and finally bone marrow edema (25%). Yang et al. reported that the principal MR findings in transient synovitis were joint effusion (100%) and synovial enhancement (78%) in the symptomatic hip joint. In addition, contralateral joint effusion (63%), synovial thickening (55%), and signal intensity (SI) alterations and enhancement in the soft tissue (31%) around the symptomatic hip joint were also found . In our study, four patients were diagnosed with septic arthritis. The MRI findings identified in all four patients were synovial thickening, joint effusion, soft-tissue edema, and bone marrow edema. One patient presented with gluteal abscess. The MRI findings were true positive in three patients and false negative in one patient; the sensitivity was 75%. Luhmann et al. found that the frequencies of MRI findings in 50 patients with septic hip joints were as follows: synovial enhancement (98%), perisynovial edema (84%), joint effusions (70%), fluid outpouching (53%), fluid enhancement (30%), synovial thickening (22%), and abnormal marrow signal (86%). The sensitivity of contrast-enhanced MRI for the detection of septic arthritis was 77% . In our study, four patients were diagnosed with neoplastic lesions. The MRI findings identified in all four patients were soft-tissue masses, joint effusion, bone marrow infiltration, and heterogeneous enhancement (100%), followed by joint involvement in three (75%) patients. The MRI findings were true positive in three patients and false negative in one patient; the sensitivity was 75%. 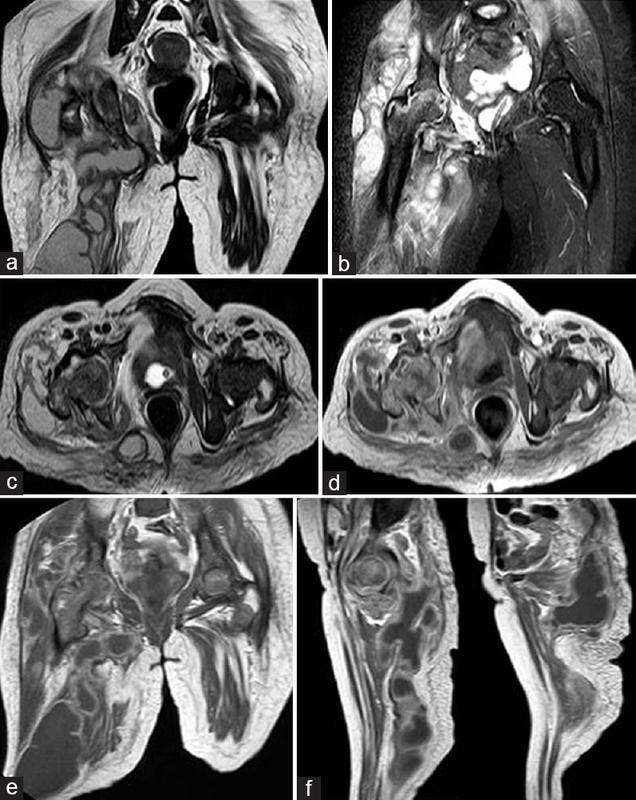 Golfieri and Baddeley  reported the following MRI findings in 25 patients with extra-articular tumors around the hip joint: marrow involvement in 24 (96%) patients, which was confirmed by surgical and pathological findings, soft-tissue involvement in 23 (92%) patients, joint involvement in six (24%) patients, neurovascular bundle involvement in four (16%) patients (all of them were malignant), and cortical destruction in 22 (88%) patients. The MRI findings were true positive in 22 patients and the sensitivity was 88% . MRI of the hip has become a valuable tool in assessing the multiple potential causes of hip pain. From this study, we conclude that MRI is a reliable image modality in investigating hip pain. It is a noninvasive, accurate, safe, and effective method for assessing patients with painful hips of different pathologies. In addition, MRI seems mandatory in cases of suspected hip disease with persistent symptoms and normal plain radiographs. 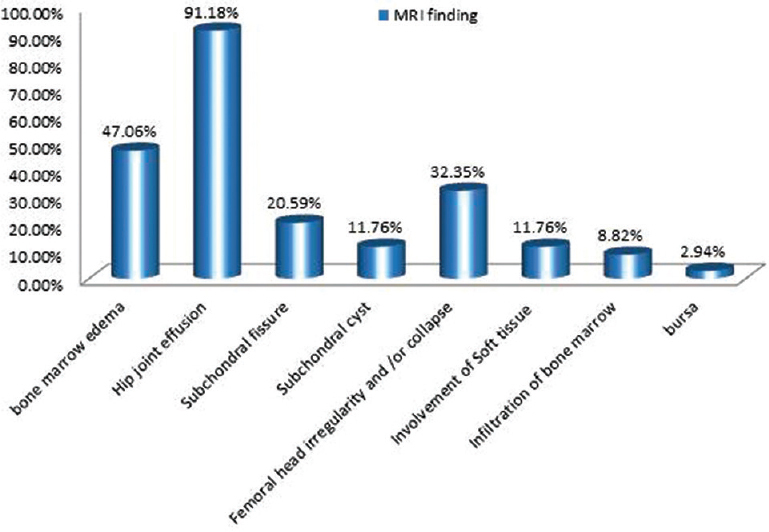 MRI provided accurate diagnosis in 90% of patients with avascular necrosis, 100% of patients with migratory osteoporosis, 88% of patients with transient synovitis, 75% of patients with septic arthritis, 100% of patients with bone marrow contusion, 75% of patients with extra-articular tumor, 100% of patients with bursitis, 100% of patients with stress fractures, and 50% of patients with osteoarthritis. We recommend the use of MRI for the early detection and staging of avascular necrosis, evaluation of the bone marrow, and detection of marrow lesions, bursitis, arthropathies, marrow replacement processes, and occult fractures. The use of intravenous gadolinium can be useful in the evaluation of primary musculoskeletal tumors, to detect intraosseous spread within the marrow, and soft-tissue infiltration and inflammatory conditions such as osteomyelitis and septic arthritis. Ludwig O, Pierre B, Herman J. The hip in a system of orthopaedic medicine. Vol. 16. 7th ed. London: Churchill Livingstone Publishers; 2003.pp. 716–41. Callaghan JJ, Rosenberg AG, Rubash HE. The adult hip. 2nd ed. Philadelphia, PA: Lippincott, Williams and Wilkins; 2009. pp. 836–42. Llauger J, Palmer J, Rosón N, Bagué S, Camins A, Cremades R. Non septic monoarthritis: imaging features with clinical and histopathologic correlation. Radiographics 2000; 20:S263–S278. Wilson JJ, Furukawa M. Evaluation of the patient with hip pain. Am Fam Physician 2014; 89:27–34. Ragab Y, Emad Y, Abou-Zeid A. 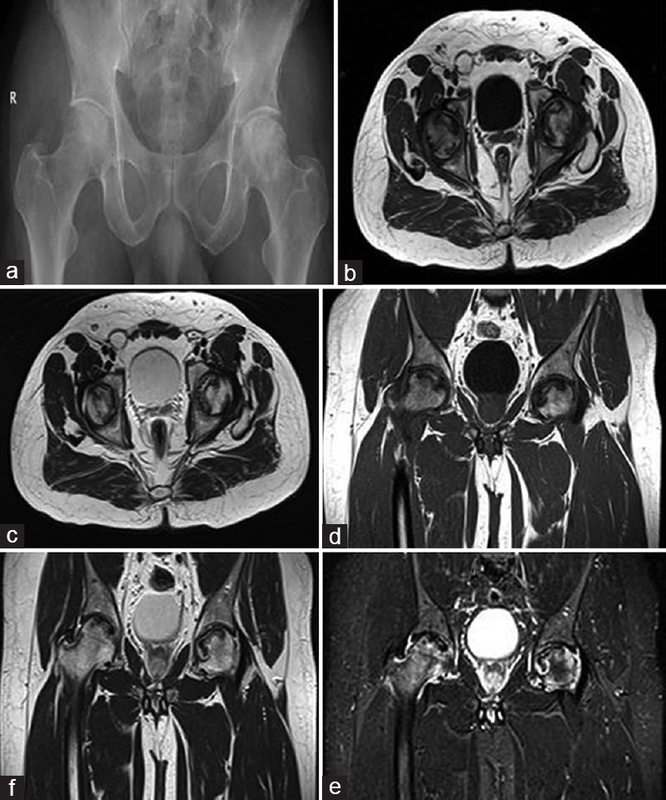 Bone marrow edema syndromes of the hip: MRI features in different hip disorders. 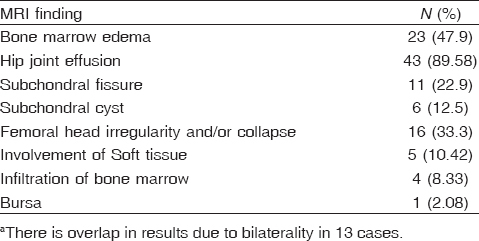 Clin Rheumatol 2008; 27:475–482. Kamal D, Traistaru R, Alexandru DO, Grecu DC, Mogoanta L. Epidemiologic study of avascular necrosis of the femoral head. Curr Health Sci J 2013; 39:3. Takatori Y, Kokubo T, Ninomiya S. Avascular necrosis of the femoral head. JBJS 2000; 75:217–221. Yang WJ, Im SA, Lim G-Y, Chun HJ, Jung NY, Sung MS, Choi BG. MR imaging of transient synovitis: differentiation from septic arthritis. Pediatr Radiol 2009; 36:1154–1158. Luhmann SJ, Jones A, Schootman M, Gordon JE, Schoenecker PL, Luhmann JD. Differentiation between septic arthritis and transient synovitis of the hip in children with clinical prediction algorithms. J Bone Joint Surg Am 2008; 86:956–962. Golfieri R, Baddeley H. The role of STIR sequence in magnetic resonance imaging examination of bone tumors. Br J Radiol 2002; 63:251–256.